Washing cloth diapers is probably the reason most people do not cloth diaper. The thought of sticking dirty diapers in the washing machine leaves people thinking that their machine will forever be contaminated and never truly clean again. Thankfully, laundry machines are perfectly efficient and do a great job of keeping diapers and the machine itself clean. Besides, odds are that people everywhere have washed some pretty gross clothes in the laundry just due to accidents or illnesses. The real concern about washing cloth diapers is just how to do it. If you ask 10 different families how they wash their diapers, you will get 10 different answers. There does not seem to be a standard when it comes to cleaning cloth diapers. I will give you the general method that most people loosely follow below. First: Do not store your diapers in a wet pail. A wet pail (aka bucket of water) was the method of the past but it doesn’t work any better in my opinion, you have to deal with all that dirty water, and it’s a drowning hazard. Skip the wet pail. Instead, use a pail with a diaper liner or a hanging wet bag to store your diapers in. Secondly: If your baby is exclusively breastfed then diapers can be washed poop and all since breastmilk poop is water soluble. If baby is on formula or solids, then poop must be dunked, swished, scraped, or sprayed off first. Third: There are a few washing “don’ts” when it comes to washing cloth diapers. Do not use bleach, Do not use fabric softeners. Do not use detergent that is not safe for cloth diapers. If you are unsure about what detergent to use, check out this chart. Step 1: After a diaper change, store the dirty diapers in a pail with a diaper liner or in a hanging wet bag. Step 2: Cloth diapers need to be washed every 2-3 days. You really don’t want to go longer then 3 days usually as you then run the risk of mildew and stink issues. Step 3: On wash day, toss all the dirty diapers along with your pail liner or wet bag into the laundry machine. Step 4: Do a rinse load (just a rinse, not a wash) on cold. Step 6: Do one extra rinse load. (some machines have an extra rinse built in, some do not and you must manually re-rinse) This is to remove all the detergent. Step 7: Shells and diaper covers are best line dried to preserve their waterproof qualities. Inserts, wet bags, and any other cloth products can be dried in the dryer. To sum up: Store the diapers in a bag or pail and wash every 2-3 days. Washing routine would be rinse on cold, normal wash on hot, extra rinse and then dry. However, as I said everyone does their laundry differently. Here is what I do. It might not work for you but it is what we do. Steps 1-3: Same as above. Step 4: Wash on cold with regular amount of detergent that I would normally use. Once baby gets to about 6 months I switch to washing on warm because I find that it just needs it with the older babies. Step 5: No extra rinse! Shocking I know, but my cloth diaper brand tells me that washing machines are efficient enough now that the extra rinse is not needed! To sum up: Store the diapers in a bag or pail and wash every 2-3 days. My washing routine is normal wash on warm and then dry. Just like I’d wash any of my laundry! As you can see, I do not do a pre-rinse and I wash only in cold. I do use an all temperature laundry detergent so that my diapers/laundry gets just as clean on cold as it would on hot. 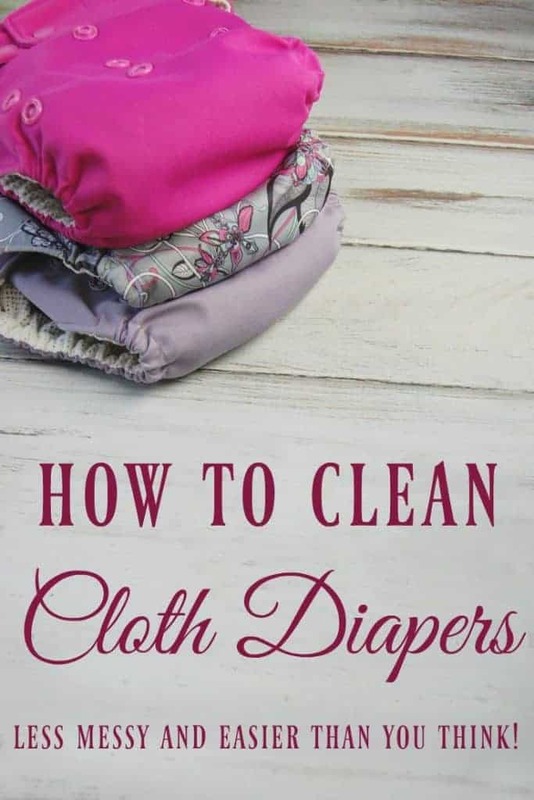 I personally, have never had a problem getting my diapers clean this way and I like that I save time and money by cutting out a pre-rinse and washing on cold. As I mentioned before, I do switch to warm around baby’s 6 month mark because heavy urine soaked diapers or babies eating solids seems to make cold water washing not quite as effective. Not all wash routines are alike and I do not think they should be. Everyone has different types of water, washers, diapers and so forth. I did want to give the general idea of washing diapers however. Washing diapers is not some time consuming task, nor a dirty one. It really is not an extra effort at all; you just need to find the routine that works best for you. i was excited to see you write about this Brittany. just curious, what detergent are you using for your diapers?? I have a HE machine and have used Rockn Green in the past and I am currently using Ruby Moon. I will definately have to check this out – thanks!! This is great. I wrote an introduction to cloth diapers for people who are new to it. I'm going to link to this from my blog because it's a great followup to my page. How do you get rid of the ammonia smell? They dont stay like that just when i put them in the pail. I wash every 2-3 days but when I put them in washer the ammonia is so bad it takes my breath. TC – So are you saying they come out smelling ok and when on baby they smell ok? Is it just in the pail and washer? I think that's pretty normal (especially for older babies). It's just if they smell gross after cleaning or the second the get wet when on baby that you would want to "strip" them. I make my own detergent from 20 mule team borax, washing soda and Fels Naptha soap, would this be okay to wash diapers with? There seems to be some controversy on whether or not borax, washing soda, and Fels Naptha are safe for cloth diapers. Some cloth diaper companies say to not use them. I know of many cloth diaper parents who do use their own detergent (with either some or all of those ingredients) and as far as cleaning cloth diapers goes, it seems to be fine… the question would be if cloth diapers hold up well with that type of detergent. I am so happy to see others using cloth diapers! I used them with all three of my kids, because they got rashes from the disposable ones. I thought they were so much easier than I was expecting! 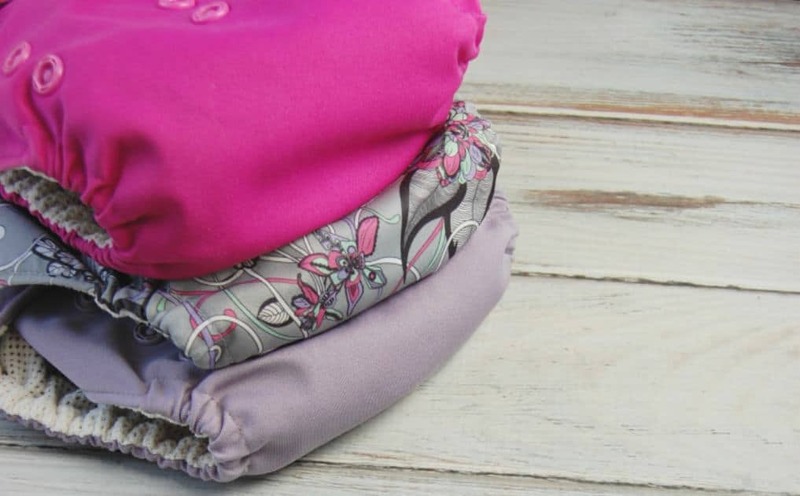 I am so thankful for this set of posts "Cloth Diapers 101" My husband and I have a 5 month old and became interested in this subject and I have felt so lost and your site has helped immensely. I do ask though, I have to formula feed my daughter with an organic formula. You said that the poop needs to be removed before washing….. do you have suggestions? I am trying to think of ways that would be easy and not completely disgusting, lol. The best I am coming up with is taking a wet wipe and scooping it off. Do you have any other suggestions? Here are the common ways of removing poop before washing: 1) the dunk and swish…this means sticking the diaper into the toilet and swishing around in the water until the poop is gone. 2) scrape what you can…. using a wipe, toilet paper, spatula, etc you scrape what you can into the toilet 3) the diaper sprayer…. this is most "hands free" way. You buy a diaper sprayer which is a lot like a mini shower head/sink sprayer. It attaches to your toilet and you just spray the poop into the toilet. How do you strip them? All of our diapers have a horrible ammonia smell even after washing. Anonymous – There are a few ways to strip diapers (some crunchier then others). I prefer to just wash "clean" diapers on hot with no detergent until you see no bubbles (usually 3-6 times) You don't dry in between washes just wash over and over till those bubbles are gone. Some like to add vinegar or other additives to the wash.
proverbswife – just in case you havent found a satisfying way to clean out your nappies yet… we have a septic tank which means all our water goes to the same place. So I use the removeable shower head in the bathroom and pressure spray it all off. You could do the same with those cheap 'plug' on ones you can get for the bath or laundry. Thanks so much for this post. I plan on using cloth diapers but the 3 wash routine had me scared (I live in Australia and grew up in drought conditions so water is a precious commodity) But this makes me feel much more confident! Thanks again! I'm jealous of your routine! It works well and keeps your diapers from smelling like ammonia or "barnyard"? I have tried so many different routines and detergents. I've tried LOTS of detergent and I've tried the traditional "half" portion. I've tried Tide and I've tried the crunchiest detergent out there. But after a few weeks, I'm forced to use bleach because they just STINK after my LO pees in them. Sigh… I love cloth diapering but figuring out a routine that works is definitely an adventure! Yes, it works well for me. Every now and then I need to strip them (like twice a year) but that's only once the baby is 9+ months and usually after I start going longer between washings. That said, I have soft water so that helps a lot with getting diapers clean. Sorry you are having such a rough time of finding a good routine. Do you have hard water? How often do you wash? So what are your recommendations for someone washing diapers in hard water? We plan on cloth diapering when we have babies, but the water in our house is quite hard. I would probably increase the amount of detergent that I use, but are there other modifications to apply? What's your diaper stripping method? Sadly the only stripping method, I've found that works for my diapers is to use bleach. I don't like it but thankfully I only have to strip diapers a few times in the 2 years that my child is wearing them (usually in the last year). Can you tell me the difference between washing in hot and cold water? I thought washing in hot helped disinfect them but you only wash in cold. I'm hoping to eliminate the pre-rinse, too, since we have coin-op laundry, are sick of rinsing in the shower, and live in drought ridden California! There's really no difference when it comes to washing in hot or cold. As I mention in this post (http://www.pistachioproject.com/2012/01/cold-water-only.html) when it comes to disinfecting laundry, you would need water at much higher temps than most machines get to. I will say that as baby gets older, it usually seems best to go up to a warm wash… their pee just sticks a bit too much for cold water to do the job fully. So until about 6-9 months old, I wash our diapers in cold water. Once baby gets to 6-9 months I wash in warm water with a cold rinse. But I've never pre-rinsed and I never have a problem. Real detergent. Full amounts. It's human waste, it needs proper amounts of detergent. Homemade detergent is just water softeners and detergent boosters. Don't use extra rinses if you have hard water or you'll cause mineral build up. If the diapers don't smell clean, they aren't. End of story.